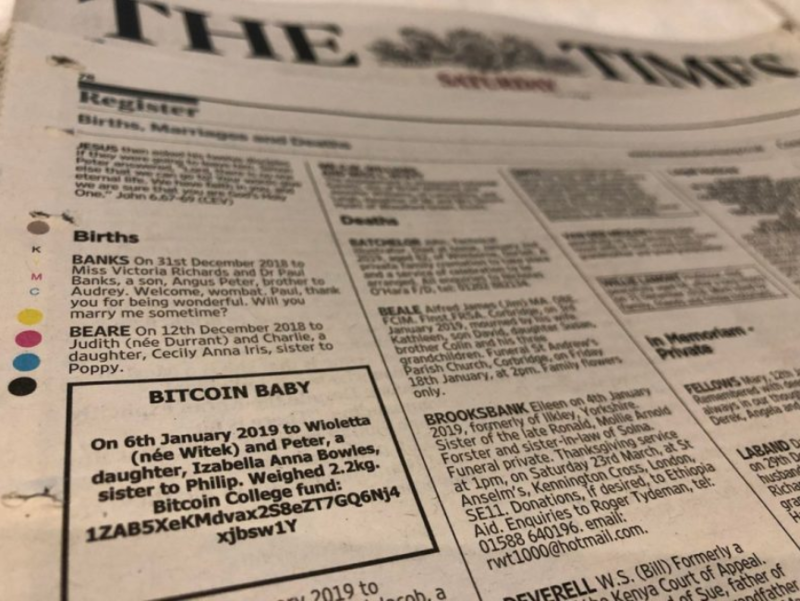 A rather interesting listing has popped up in The Times of parents seeking to raise money for their newborn baby via Bitcoin donations. Little Izabella Anna Bowles was born on January 6th, 2019. Her parents, however, have decided to waste absolutely no time in saving up for her college fund. Unlike regular parents, however, Wioletta and Peter, have decided to ask the cryptocurrency community for their financial support. On 6th January 2019 to Wioletta (nee Witek) and Peter, a daughter, Izabella Anna Bowles, sister to Philip, Weighed 2.2kg. The cryptocurrency community has been quick to respond. The first recorded transaction to that address was on January 10th. Four days later, the address has already seen 154 transactions and it contains 1.03581043 Bitcoin (BTC) 00. At the time of writing this, the BTC in the address is worth around $3,660.53. However, the overwhelming majority of users have been nothing but welcoming. The accumulated amount of BTC best shows that. One thing most of them seem to agree on, however, is the fact that it was a bad move by the parents to only publish the 33 alphanumeric address instead of the alternative QR code. A lot of users are also making the case that while the current amount of Izabella’s college fund might be insufficient to cover her tuitions if the bullish predictions for Bitcoin’s price come true, it might be more than enough in the future. Will the Bitcoin baby receive enough money to cover college? Share your prediction below!